The Ancient and Primeval Beech Forests of the Carpathians and Other Regions of Europe cover forests of the European beech in 12 countries. They comprise the largest remaining 'virgin' forests of the European beech ('Fagus sylvatica'). They also hold the largest and tallest beech specimens in the world. In preparation of my visit I had a difficult time finding any practical information about the nominated properties in Slovakia. My guidebook has nothing of any value on them, but does include a handy map called 'Snina wooden churches' that covers the same area. The IUCN evaluation holds a shady map, which seems to point out only 3 properties on the Slovak side instead of 4. A better bet for maps is the Slovak/Ukrainian nomination dossier. I also found a regional website (see link to the left, Snina Region) which has information about villages and parks. It describes access to the Vihorlat Protected Landscape via the village of Zemplínske Hámre. So I turn this route into the goal for myself today, possibly (weather and other circumstances permitting) with a walk to Morské Oko lake. On the road eastward from Kosice, I quite suddenly encounter a sign 'Morské Oko' (near Remetské Hámre) - which is the lake on Mt. Vihorlat. I drive on (foolhardedly), determined to give the other side of the mountain a go. The closer I get to the Ukraine border, the more dense the soft green coloured forest gets. Especially the area around Ubl'a is very scenic. Here also I find two villages with domed Orthodox (or Eastern Catholic?) churches. Finally I arrive at 'my approach' to Vihorlat: Zemplinkske Hámre. Its streets are filled with churchgoers, who stare at me, the outsider. I drive all the way to where the road ends ... and then there's nothing! Well, this is where the mountain starts but I can't see myself walk into the forest without any guidance. So is this WHS number 273 or a near miss? I believe I've straddled the borders of the inscribed area (or at least their buffer zones). I have seen mountains covered in thick forest of what I suppose are beeches. And I give myself some bonus points for trying! Actually I wonder if visitors ever reach the core areas, which are quite small (see the maps in the nomination dossier) and I wouldn't know how to get there without a local guide or camping out. (1) Slovakia - they have incredibly valuable naturale heritage in these WHS components, but even after 10 years after inscriptions the state party of Slovakia has not been able to decide what belongs to the component and what not, because there are huge discrepancies between reality and official proposal. The worst thing is that the strict protection has been declared in the nomination text, but reality is completely different - only certain parts of WHS are sufficiently protected by law. Unfortunately, almost nobody form Goverment, Municipalities, and local people carred about this problem in the past. Even NGOs attitude and action were problematic in my opinion. In the past and even now, logging and hunting is legal in several parts of WHS. The management of National parks of Slovakia in general is simply said one big tragedy, and wood production is sometimes prefered to nature protection. Thus, you can see too many clear cuts terribly close to WHS or even inside. Fortunately, after pressure from UNESCO, they are working hard to propose modifications of components and their buffer zones to ensure sufficient protection of OUV. The new boundaries should be examined by UNESCO together with extensions of this transnational WHS in 2020. (ii) Vihorlat main range around Morske Oko lake (accesible by ca. 5 marked tracks from Snina, Remetske Hamre, Strihovce, etc.). This are is very nice area with beautiful views and large virgin forests, but protection is even lower as compared to Bukovske Hills, because Vihorlat is not national park. Thus, relatively unspoiled areas are surrounded and penetrated by destroyed ones. (2) Germany (i) Jasmund - the chalk cliffs surrounded by beech forest is certainly beautiful and valuable, but I am afraid it is not comparable to genuine primeval forests of Carpatians. (i) Monte Cimino close to Viterbo. I could see it only from distance when travelling to Lake Vico. The site seems impresive and well protected, and I am planning to visit it as well as nearby Monte Raschio in near future. (ii) Foresta Umbra in Apulia region, Promontorio Gargano. The area is simply amazing and deserves protection as WHS. Unfortunatelly, the site is crossed by road from Mattinata to Peschici, but the most valuable parts are fenced due to strict protection. 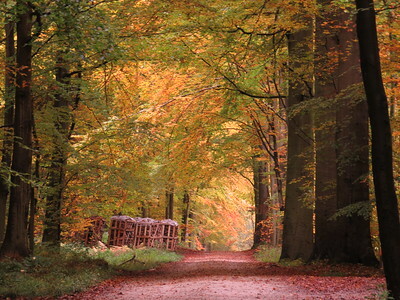 There are however footways that allows visiting the interior of the forest. The forest is unique and is influenced by so called gigantism due to excess of nutrients and minerals - I have not seen such huge yew and beech trees before (photo: me and giant taxus baccata in Foresta Umbra). What I also liked is a contrast between nearby Adriatic cost and the beech forests in attitude 800m. My only criticism goes to the visitors center of Foresta Umbra, which is advertised on numerous road banners in Gargano region. In fact, there is no visitors center at all. There are several buildings within the forest. Most of them are military or National Park management properties and thus inaccesible; The Natural History Museum looked very bizzare; Trattoria was closed in September; The nearby lake was however quite pleasent to stroll around. It certainly deserves WHS status. It is more touristy and maybe not so wild as forests on Slovakia part. Due to a bit higher attitude there are large poloninas (mountain meadows) on the mountains ranges, which are very attractive and worth-visiting as well (although poloniny area itself is not part of proposed WHS). I also admired forest management that is 1000-times better than in official WHS of Slovakia. Only shadow on my optimism concerning Polish contribution to this WHS lays in unclear politics in Poland nowdays. Therefore, the nomination was withdrawn by state party in 2017 in spite of high qualities of Polish component, which would be perfetly complementar to sites in Slovakia and Ukraine. I am afraid that it is somehow related to issue in Bielowieza forest, and Polish side wants to avoid "problems" with UNESCO in case of controversial management in forests. Although I had been to the Heinrich National Park before, I stopped at the Grumsin area of the MAB Reserve in September 2017. 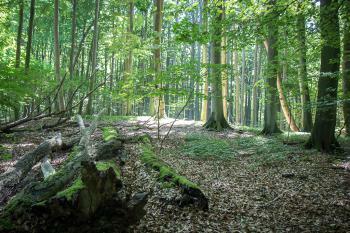 Both are part of this Primeval Beech Forest WHS in Germany (as well as in 11 other countries). A bus from Angermünde dropped me off right in front of the WHS Info Center in Altkunkendorf, but this 30 min. public bus ride that went around the most rural area I have ever seen in the state of Brandenburg was like a roller coaster ride and is highly recommended. The couple at the Info Center was extremely helpful and recommended me to take a combination of two color-coded hiking trails in the area during the 5 hours I had there. But the trails only go around the core zone, and the couple had told me that it was prohibited to walk into the core zone (as it is in the Shirakami Mountains Beech Forest WHS in Japan). Although I saw several trails that branched out into the core zone without any prohibiting signs, I didn't bother walking in, as all beech trees looked like the same to me. But because I had only driven through the Heinrich NP, this leisurely hiking, breathing the O2 emitted by the WH beech trees, was a much nicer experience. Driving out to Hainich I apologised to my wife, "I think I have gone too far with this one." The calm non-vocalised acceptance indicated I had indeed probably overstepped the mark a little. By this time our car was weaving on the deep snow atop the single track road outside the village of Craula and I had already started budgeting for how much the recovery vehicle would cost to haul us out. But we made it to the small car park at the entrance to the WHS core zone parked up and hoped that we would be able to get out again. A thick white blanket wrapped the whole landscape as the deep snow blended seamlessly with the heavy skies when I jumped out of the car and donned my coat, scarf and gloves. "It's ok you go do your thing, I'll take some photos around here and stay warm." said my wife, again cementing her role as the sane one in our relationship. So off I trekked, not really planning on getting far, just hoping I could find something that I could comfortably identify as being a beech tree. It didn't take me long, as a few hundred meters from the car park were the tall thin black stalks of trees. 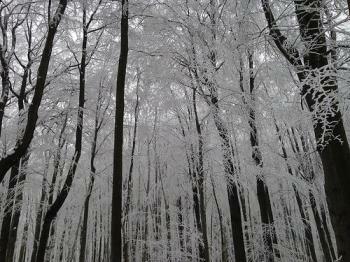 Snow and ice clung to the dark wood of the leafless trees which were set against powdery grey skies and made the whole scene a glorious monochrome tableau. There was utter silence as I gawped at the spectacle, broken only by the crunch of snowy footsteps behind me. I turned and saw a familiar beaming face, as my wife had been sucked further from the car by the highly unique surroundings. Almost a year to the day after we had shared the same gleeful, uncomprehending glances at the Monarch Butterfly Reserve in Mexico we were repeating them in front of a clump of trees. A most unexpected outcome, even a few minutes beforehand. That was about it, we tried in vain to capture the scene in photographs, but nothing could really do it justice. Feeling cold and not really sure that another half hour of walking would provide us with anything to top the experience we decided to head back to the car, after a swift but magical visit. I started up the car and was exceptionally relieved to make it out of the thick snow and back on the main roads for the short drive to Wartburg. Unexpectedly magnificent and utterly stunning. The specific weather and timing of our trip made this a rather magical visit to what may otherwise be a slightly underwhelming site but for us it was one that left that indelible imprint of a really special location that we only visited because of its place on the list. One of the best information centres is at Jasmund National Park – and this is the one I visited. It has an excellent video presentation and a detailed museum with facts and figures about the forests. There are also guided tours and talks from local experts. 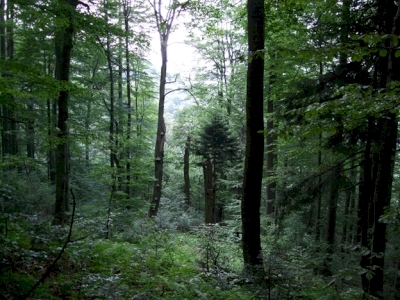 The Sonian Forest near Brussels is proposed as an extension to the Primeval Beech Forests of The Carpathians and ancient beech forests of Germany. If all goes well, this is scheduled to materialize in 2017. The extension proposal is a trans-border series consisting of 33 components, located in 11 State Parties: Albania, Slovenia, Romania, Italy, Poland, Austria (in the lead), Croatia, Bulgaria, Ukraine, Spain and Belgium. This in addition to the current WHS that already covers 15 beech forests in Slovakia, Ukraine and Germany. 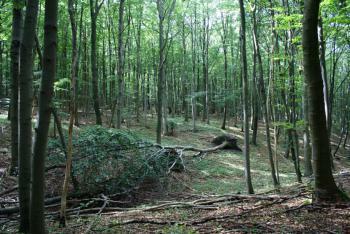 The listed Primeval Beech Forests represent pure and mixed stands of European Beech in various environmental conditions. One wonders if so many more examples are really necessary. The nominating countries are serious about it though, and have developed a classification system defining Beech Forests of Regions (BFR) in Europe. Each BFR is characterized by specific climatic conditions and flora, and demonstrates an individual piece of history of the beech forests. The Sonian Forest is the only remaining beech forest in the Atlantic climate zone. It marks the western limit of the species range in Europe. 74% of the forest area is covered with beech, part of the scattered remains of the ancient Silva Carbonaria or Charcoal Forest. The Sonian Forest furthermore has nice trivia value as its area covers parts of all three regions of Belgium: Flanders, the Brussels-Capital Region and Wallonia. And it would be another addition to the already extensive Brussels WH Hotspot. I feel a bit bad about my first visit to a WH listed Beech Forest: in 2008 I spent half a day driving around the east of Slovakia. I saw a lot of forest, probably beech - but I searched in vain for an access point. So I try to make up with this Belgian location once it is inscribed. The Sonian Forest website shows various ‘entry points’ of which I choose ‘Toegangspoort Groenendaal (Hoeilaart)’. This is also where the Jan van Ruusbroec Museum is, a somewhat old school museum about the forest including the obligatory stuffed mammals. I was surprised to learn from it that exotic fauna species such as parakeets and squirrels have been introduced to the Sonian Forest and are thriving. Its many species of bat led to it being classified as a Natura 2000 protected site. The Sonian Forest is nicknamed ‘Beech Cathedral’: the beeches can reach a height of 50 meters, giving the forest the character of a gothic cathedral. Some are over 250 years old. They originate from Austrian Habsburg times, when the landscape architect Joachim Zinner planted beeches on a massive scale. This resulted in long avenues with lines of trees running along each side. It's a pleasant place for a Sunday walk, but I had trouble finding the designated hiking paths (marked by orange or red painted wooden stumps) and got bored quickly by the endless rows of trees. A coordinated nomination from 11 countries is pretty difficult to follow through in one attempt. The so-called Vienna Short List even included no less than 20 countries, including Kosovo! As most beeches in the Sonian Forest date back to human intervention in the 18th century, I don’t really grasp their ‘primeval’ or ‘virgin’ classification. But somewhere along the way during the nomination process 'primeval' has been changed into 'ancient'. And 'ancient' is now defined as 'at least 150 years old'. The title of the future extended WHS will probably be 'Ancient Beech Forests of Europe' - steering away from cumbersome constructions such as 'Primeval Beech Forests of The Carpathians and ancient beech forests of Germany and those of Albania and the beeches in Austria and those in Poland (and so on)'. With the exdtension of this WHS to include some German beech forests, I have now visited three of these. Of them the Jasmund National Park on Rugen Island was the most spectacular, where the forest appears to tumble down the cliffs to meet the Baltic Sea. I reached the Park HQ at Konigsstuhl by bus #20 from Sassnitz station and enjoyed the comprehensive audio-visual displays at the HQ. 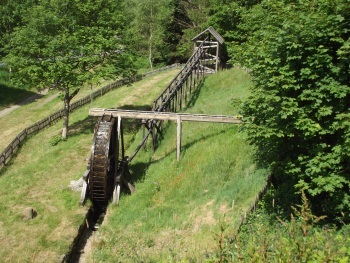 The Kellerwald National Park had many hiking trails on offer, of different lengths and grades. I reached the park from Kassel on bus #555 travelling one way via Frankenberg and returning via Korbach. I also visited Thiemsburg in the Hainich National Park, travelling on bus #27A from Eisenach station. The main attraction here seemed to be the Baumkronenpfad, a walkway through the forest canopy. The "easiest" way to see the inscribed area within Vihorlat is to hike up to Sninsky kamen, which is just within the core area, and which offers panoramic views of the overall protected area within Vihorlat. The hike up to Sninsky Kamen starts from Morske Oko, which in turn can be reached by driving to the end of the road from Remetske Hamre (around 20km from Michalovce). Morske Oko seems to be a somewhat popular tourist location (at least for locals) as the site features a car park, signposted trail markers, and there also were several people strolling around the lake. The trail up to Sninsky Kamen, on the other hand, is less popular even if being relatively easy (with the exception of some missing trail markers). In fact, the main challenge is to reach Vihorlat in the first place as the park is located closer to Ukrainian border (only Ukrainian mobile network provider was occasionally within range inside the park) than any major Slovakian city. In terms of sights, the descriptions of the sights within the other reviews seem rather well fitting also for Vihorlat. The forest areas are rather thick and pristine, with the best areas located close to the peak (and hence the inscribed area). As the area is quite far from large cities and relatively undisturbed by human visitors, the site also offers possibilities for spotting wildlife (managed to spot a fox and a small deer during my visit). All in all, an area well worth of protection, and a nice (even if not outstanding) location to visit, albeit at a rather remote location. Jasmund National Parks is on Rugen. My ferry from Sweden was along Jasmund National Park so I really enjoy watching closer to Konigsstuhl and the part of the Jasmund National Park. There was also blue/ green water at this unique park. Stena Line has ferry service between Trelleborg, Sweden and Sassnitz, Germany daily. I should to visit this park in the next time but on foot in this park. Berlin-based travelers can easily visit the Grumsin Forest in one day. The closest train station to the park is Angermünde (about an hour from Berlin Hauptbahnhof). Buses run hourly from there to Altkünkendorf town. 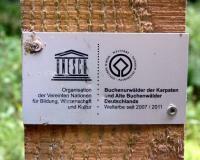 The new visitor center in Altkünkendorf provides information on hikes, trails inside the forest. Walking inside the forest is quite an experience, the type you read in German fairy tales. The forest is dark; some areas do not get sunshine. When choosing which of the 5 German Beech forests to visit we looked for one which was reasonably close to our main route for other WHS and gave us the chance definitely to enter the inscribed area with a hike of 1-2 hours from a roadhead. It came down to 2 – Hainich which is north of Eisenach and therefore convenient for a visit to the Wartburg and Kellerwald-Edersee which is west of Kassel and therefore convenient for a visit to the Bergpark. It is worth noting that in the case of all 5 WHS inscriptions the inscribed area is significantly smaller than the National Park or Reserve within which they are situated. The inscribed area will have been chosen because it contains the most significant primary growth forest - inevitably that tends to put it in the centre of the Park/Reserve which will also encompass secondary growth areas which will probably contain areas of modern re-planting or re-growth. Taking it in a clockwise direction you need to leave it at the bottom where the lake arm reaches in and then cross the bridge going west. But you are still not in the inscribed area!! You need to follow the path towards Asel Sud along the banks of the Edersee and, at some (unmarked) point will enter the WHS. However, as we had copies of both the Nomination File and the Information Centre maps we felt able to strike inland and uphill at the bridge so as to make a circuit coming back along the shore and thus get into a “wilder” part of the forest. We eventually made our way back down to the lake approximately where the Western end of the inscribed area should have been – but we had still not seen ANY “proof” in the form of notice boards, logos etc that we had actually entered the inscribed area! The frequent notice boards both at the car park and along the route describing land form, flora and fauna were liberally covered with logos for numerous ministries and programs but the UNESCO one was notablye absent! This is possibly due to the fact that the NP was created in 2004 and all the signage was completed then – whereas UNESCO inscription only came in 2011. But it isn’t like Germany not to, very visibly, “celebrate” Welterbe status - even if it did mean redoing all the signs! As another attempt we set off further towards Asel Sud than we had intended in order to scout the western boundary and there it was – in the undergrowth, where the path crossed a stream, a small post with an even smaller metal tag screwed to it displaying UNESCO and WH logos! (photo). Apart from the “proven” success of entering the inscribed area, what else did we gain from our c 2 hour hike (we could by the way easily have continued to Asel where food and drink is available). The path along the Edersee is quite busy with cyclists and is set up for park ranger 4 x4s so I would certainly recommend going inland. There we found some very pleasant quiet mossy glades with vast numbers of fungi and glorious vistas through the trees in the dappled sunlight. We didn’t see any mammals but did get nice views of Great Crested Grebe on the Edersee and, for us, the star sight of an Osprey swooping to catch a fish – a sight we have tried to see on many occasions without success in Africa and Scotland! I visited the Kellerwald-Edersee National Park in Germany and spent a great day hiking around the primeval beech forest. Minimal human intervention occurs in the national park which means that trees are left to grow freely. I encountered several beech trees that fell naturally and were completely taken over by wild mushrooms, moss, ferns and other vegetation. The Kellerwald Information Center was my starting point, with interesting informative leaflets, videos and hiking maps for free! Plenty of parking free of charge too! The easiest route (Hagenstein) turned out to be quite rewarding and I spotted the splendid Red Kite, Black Kites, and a woodpecker. There are many species of beetles to be found and interesting flora too. I hope to visit other sites in other countries to be able to compare between them, nonetheless the Kellerwald-Edersee Park surely deserves to be inscribed in the list. The local people in eastern Slovakia do not understand the interest in their trees; they have been surrounded by them for millenia. But having these forests protected for the future is priceless. 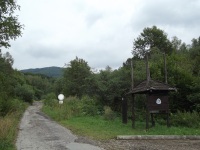 Vihorlat : I reached the end of the road in Zemplinske Hamre by bus from Snina, the same spot that Els reached. I crossed a bridge and found a few marked tracks into the forest, but without the benefit of a trail map did not follow them very far. Stuznica : this part of the Poloniny National Park is accessed by bus from Snina to Nova Sedlice. From the bus stop a track continues past the National Park office up the corner where Slovakia, Ukraine and Poland meet. In July 2011 I planned a long weekend Germany. 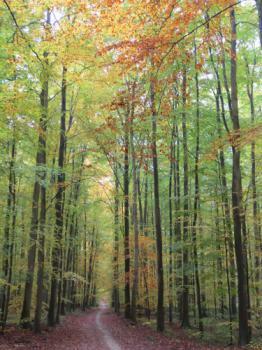 After my visit to the Fagus Factory (Alfeld) I drove to the Kellerwald NP. 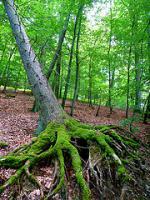 The Kellerwald is part of the Primeval Beech Forests of the Carpathians and the Ancient Beech Forests of Germany. Kellerwald is inscribed in July 2011. I arrived late in the afternoon and decided to visit first the Kellerwald information centre. The centre is build in 2008 and easy to find at the edge of the parc. The building is very nice and I paid 6 euro for the little exhibition about the wildlife inside the parc. The information is totally made with computergraphics. Also at the end they showed a 3D-movie about the parc. The visit to the centre is a good start before the hiking. Free maps with the trails are available at the desk of the centre. I went to my hotel at the other side of the parc, near the Wildtierparc (animalparc). That was a ride of almost 40 minuts along the Edersee. Beautiful ! The next day it was raining and cold, not really perfect for a good hike. The trails where slippery and muddy . So...I changed my plan and decided to go up with the cable train (standseilbahn). In 10 minuts I was 300 meters higher into the forest. First I walked to the viewpoint and later I walked a little bit on different trails. Kellerwald NP is easy to visit. There are a lot of trails (difficult and easy). The signs are very good. On the internet and in the information centre is a lot of information available. It was the visit more then worth. Only the rain was not so nice that day. I walked back to my hotel where I had parked my car. I was tired and I had no more energy to visit the wildtierparc. With a good feeling I drove back to my home (Netherlands). 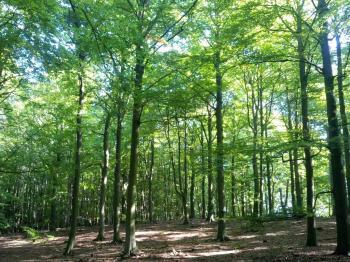 In 2009 I visited Hainich national park, one of the five german properties that extend the Carpathian beech forrest WHS in 2011. 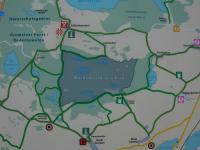 It is easy to get there, the park is at the motorway A4, very close to the Wartburg castle in Eisenach. The nominated area is the core zone of the park and represents about one-third of the entire national park. I first went to the information center „Thiemsburg“ and asked which of the many marked trails will give the best impression of the area nominated for WHS. A very nice man at the information recomended the „Sperbersgrundweg“, a 6 km loop walking trail, that starts at the car park „Craulaer Kreuz“. He was very exited about the upcoming WHS nomination and explained to me that is a major difference between the German and Carpathian forests that they are located at different heights. The three sites in the north-east of Germany are at sea level, Hainich and Kellerwald are in the lower highlands (200 to 600 m above sea level), and the Carpathian forests are above 1000 m sea level. I'm not an expert in botany, so that I can not judge whether this warrants the inscrption. For me it was just a forest, certainly a beautiful forest. Beeches are large and amazing trees and I really enjoyed my walk through the forest. But it is just a forest. For those who think of Grand Cayon or the Jungfrau Protected Area in the Alps as an natural WHS, would probably be disappointed. However, I have to admit that the other german properties could be more interesting in terms of the landscape: Jasmund lies on the coast of the island of Rügen and there are impressive chalk riffs, Serrahn and Grumsin are in the Mecklenburg lake district. In the „Thiemsburg“ information center is also the entrance to a treetop walk (entrance fee 8,50 Euro), which does not belong to the WHS but is worth a visit. Basic info about Slovakian part only. Stuzica Reserve is the only easy accessible part of Heritage (with marked footpaths). Havesova and Vihorlat are located in remote part (if you have good map you can go there but there are no roads), Rozok is close to Ukrainian border with a road passing through but its not a marked footpath. Stuzica in Slovakia is somehow similar to Bialowieza Forest, not in type of flora but as the area of no human activity. All fallen trees stay as they are the whole area is big enough to host big mammals, there are no paved roads inside the reserve. Two marked footpaths are the only way to get there. 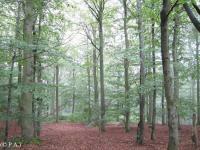 To include the Ancient Beech Forests of Germany. From "Primeval Beech Forests of the Carpathians" to "Primeval Beech Forests of the Carpathians and the Ancient Beech Forests of Germany"
As "Primeval Forests of Slovakia"